Biranchi Narayan Temple, popularly known as ‘Wooden Konark’ is an ancient shrine situated at Buguda, about 92 km from Chhatrapur, in Ganjam District of Odisha. It was built by King Srikar Bhanja in 1790. The presiding deity here is Biranchi Narayan. The image of Lord Biranchi Narayan was recovered from the ruins of Malatigarh. Biranchi Narayan Temple is built in the form of a chariot driven by seven horses. This temple of Odisha is noted for its exquisite wood carvings and beautiful wall paintings. Maghasaptami, Samba Dashami, Rath Yatra, Danda Yatra (April), Durga Puja and Kali Puja are the major festivals celebrated here. 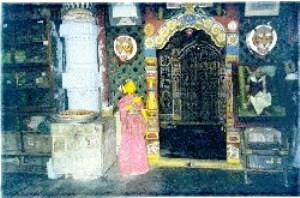 The temple is also referred to as Bruddha Khola Temple.